Unfazed by the heat and humidity, we rented bikes for day two in order to expand our exploration outside of the reaches of the trolleys and our feet. New Orleans was a surprisingly bike friendly city with plenty of bike lanes earmarked for bikers throughout the town. 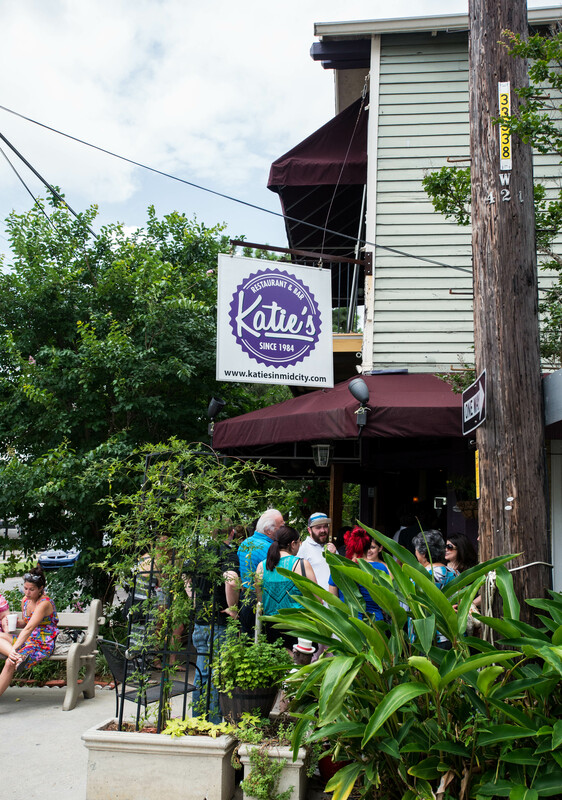 With our new mode of transportation in tow, we set out early on Sunday to venture up to Midcity just beyond the Bayou in time for brunch at Katie’s Restaurant. The second we walked up to the unassuming spot in the middle of a residential area, we could already tell that this was a low key neighborhood spot with great food judging by the crowd outside. 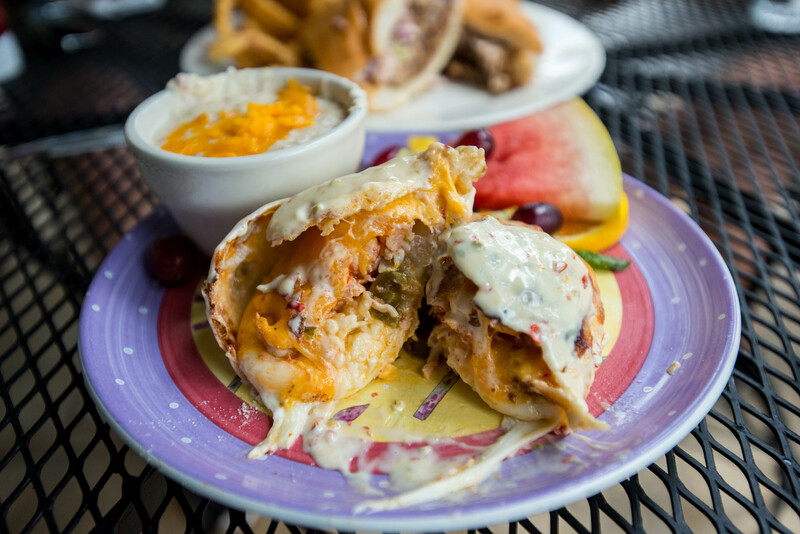 The menu here was straightforward but not without its New Orleans twist. Besides the typical brunch staples of omelets and steak and eggs, there were beignets. Not just any beignets, crawfish beignets. This was a delicious departure from the sweet fried doughy treat that we all know and love. 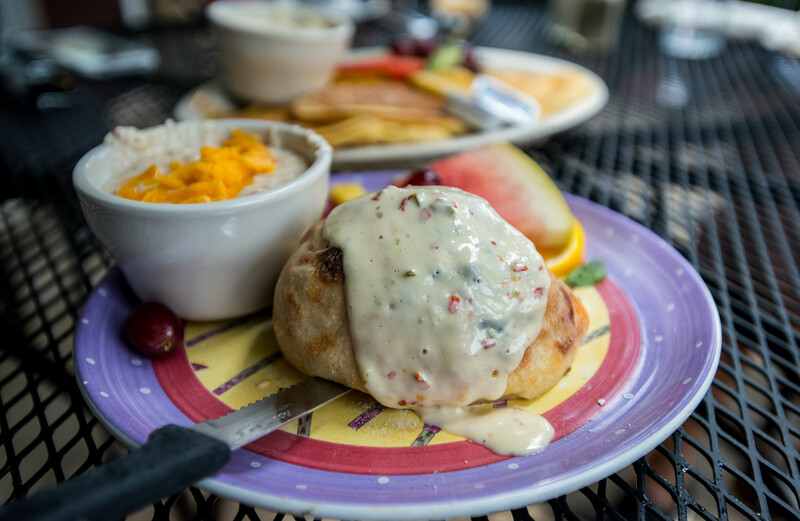 Instead, the beignet was stuffed with a decadent mixture of crawfish, mozzarella, provel, peppers and onions. Topped with a rich slightly spicy jalapeno aioli, the sizable beignet was not for the faint of heart. Especially when it also comes with a small cup of some of the best creamiest cheese grits I have had. Another Katie’s specialty was their cochon de lait. 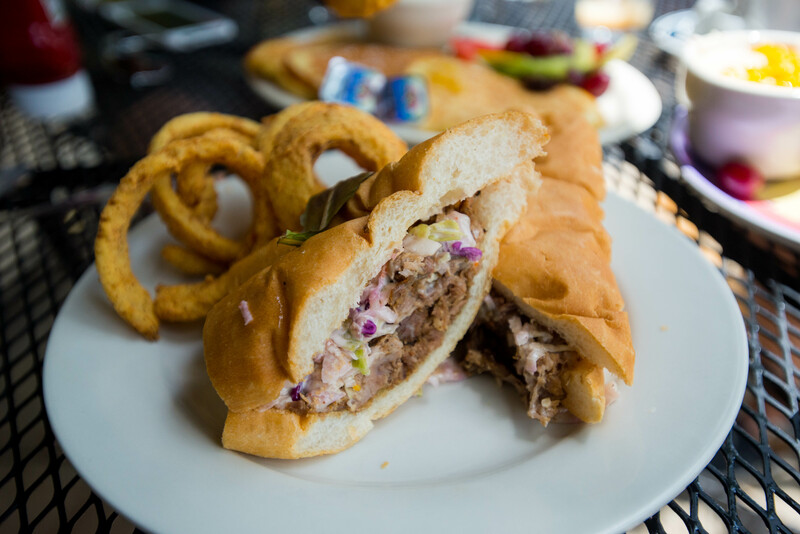 Two pieces of Gendusa french bread was topped with their homemade cochon de lait and creole slaw for a little crunch. As if the sandwich wasn’t enough, it also came with some deliciously light onion rings that were difficult to resist. 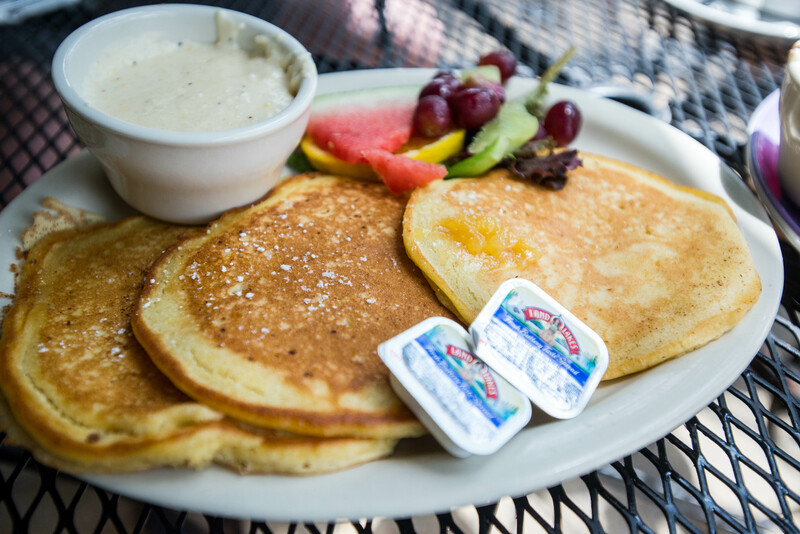 And for something sweet, we sampled a plate of the lemon ricotta pancakes. Three generous pieces of fluffy buttermilk pancakes were stuffed with creamy ricotta and perfumed with lemon zest. Just like everything else at Katie’s, these were simple yet delicious. Needless to say, we indulged for brunch and took our time just soaking in the rays from our table on the sidewalk. After sufficient time had passed for us to be able to mobilize again, we managed to stop by the Bayou music festival by the water and even hop by on the bikes. Our afternoon ride took us through City Park and then further west before turning south towards beautiful Tulane. Before we knew it, it was time for dinner and we had just the spot in mind, Frankie and Johnny’s. 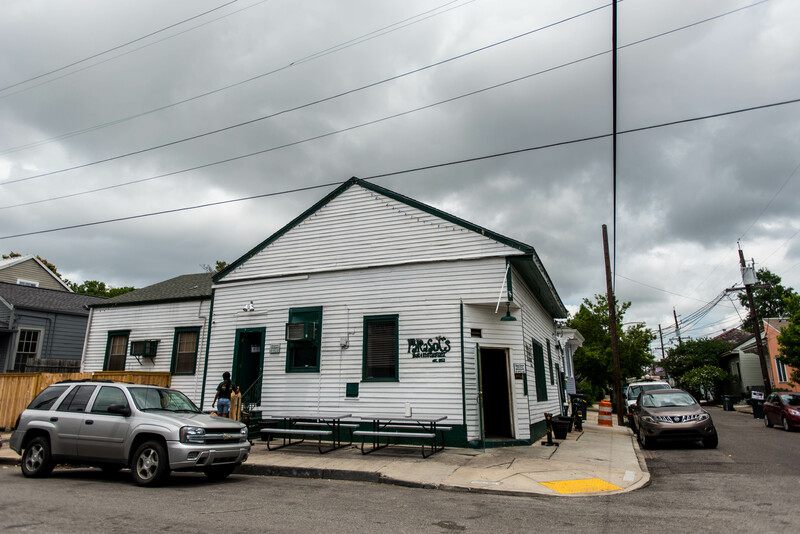 Recommended by our bartender and neighbors at Peche the night before for its crawfish boil, Frankie and Johnny’s was just the low key spot for us refuel. Located in Audobon, the restaurant stood alone between the residential neighborhood and the industrial waterfront. One look inside the dark and homey restaurant filled with locals enjoying an early Sunday supper and we knew we had picked the right spot. 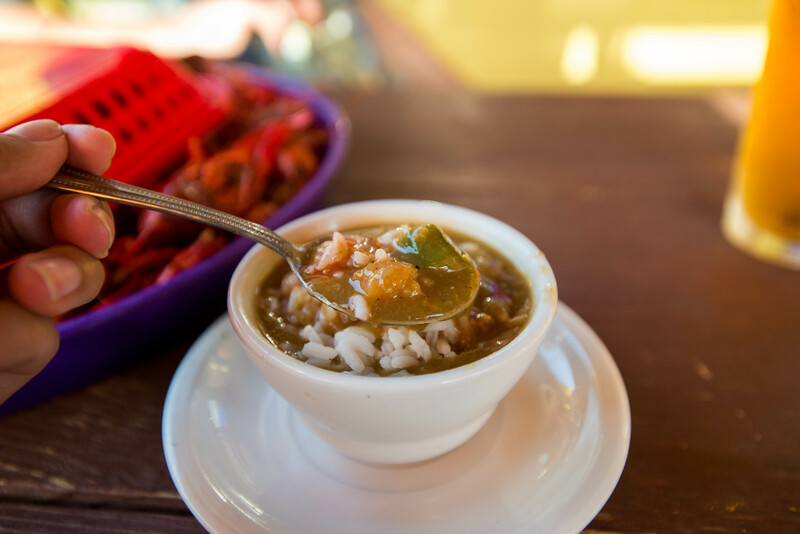 We had come with one thing on our mind but it didn’t hurt to start with a small cup of gumbo for a little variety. 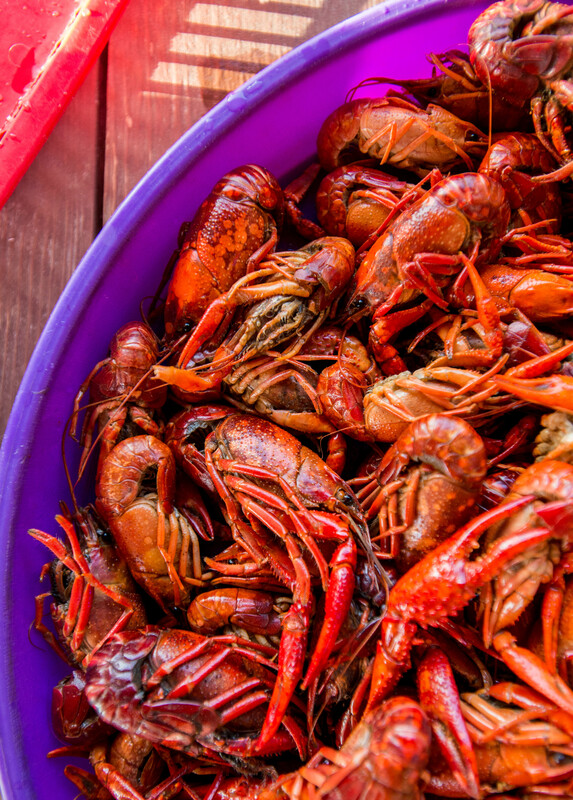 And now onto the real star of the night, the crawfish. And at just shy of five dollars a pound, we happily ordered 4 pounds of these delicious critters to start. 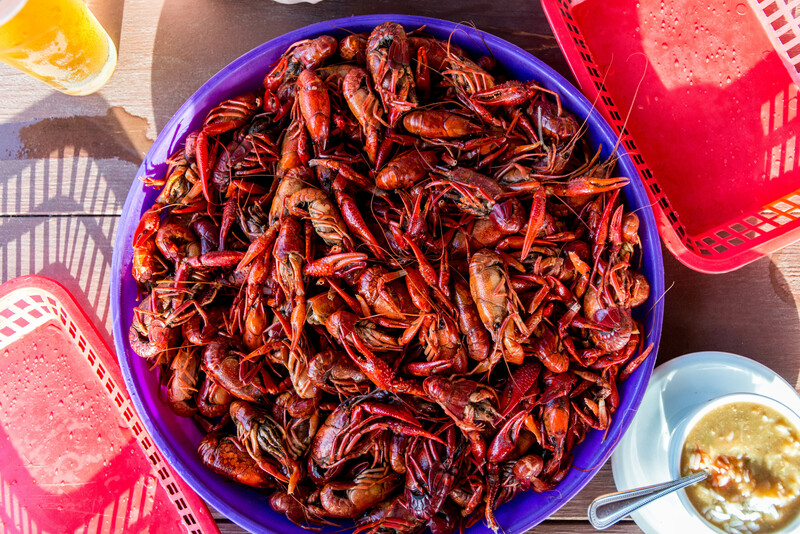 Served here rather simply with no sides or accompaniments, the crawfish boil here was truly just about the crawfish currently in season. 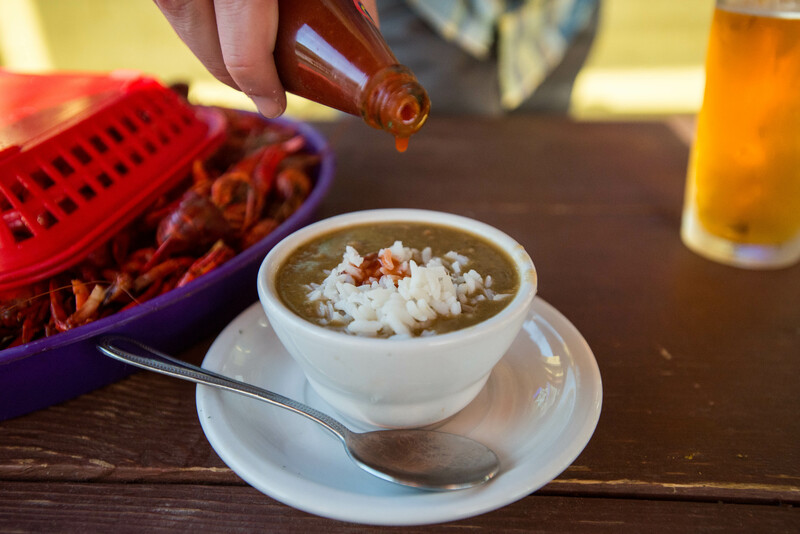 Cooked in a flavorful broth, the meaty crawfish easily came apart with a few quick nimble strokes which we mastered by the end of our pile. The boil was spicy but the heat built up gradually on our tongue as we worked our way through the four pounds, culminating to a lovely warmth that never became overwhelming. Even though we still had a little more room in our stomachs, our fingers grew rather wary by the end of our pile so we sadly had to call it quits after merely four pounds. No where near the 5 pounds that our waitress supposedly can take down all by herself. Even though we had booked our lodging closer to the intersection of French Quarters and Treme, it seems that we just couldn’t stay away from the Garden District and St. Charles Street. After a morning of meandering the blocks of the Garden District and poking our heads into Lafayette cemetery, we found ourselves at the intersection of Garden District and the slightly less upscale neighborhood of Irish Channel. Hungry from our exploring, we were looking for a lunch spot when we came across Parasol’s. 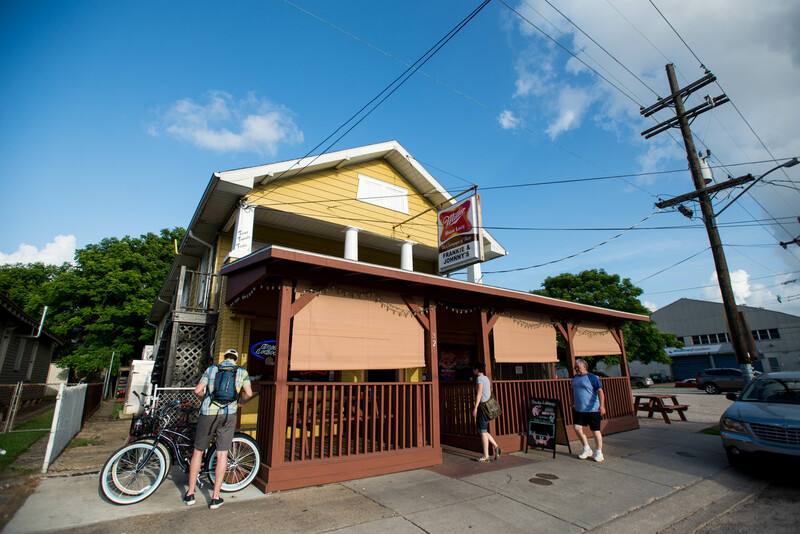 Known for their poboys, Parasol’s was another no frill and no fuss spot, a sure sign of a good meal to come. And it did not disappoint. We chose to sit downstairs at the bar to keep our bartender company. He in turn helped steer us from ordering way too much food. As it turns out, the portions here like many other establishments in New Orleans can be quite large. 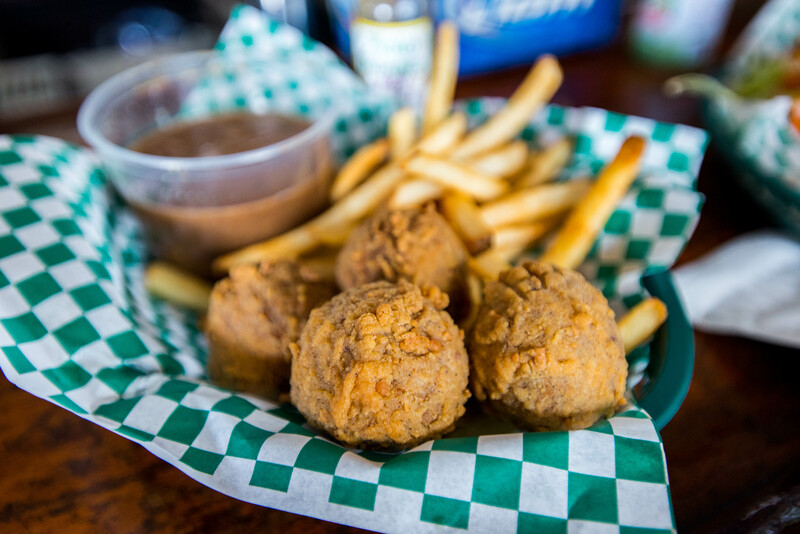 We started with a daily special appetizer, boudin balls with homemade gravy. Deep fried spheres of delicious pork mixed with rice, these came four to an order with a side of fries. 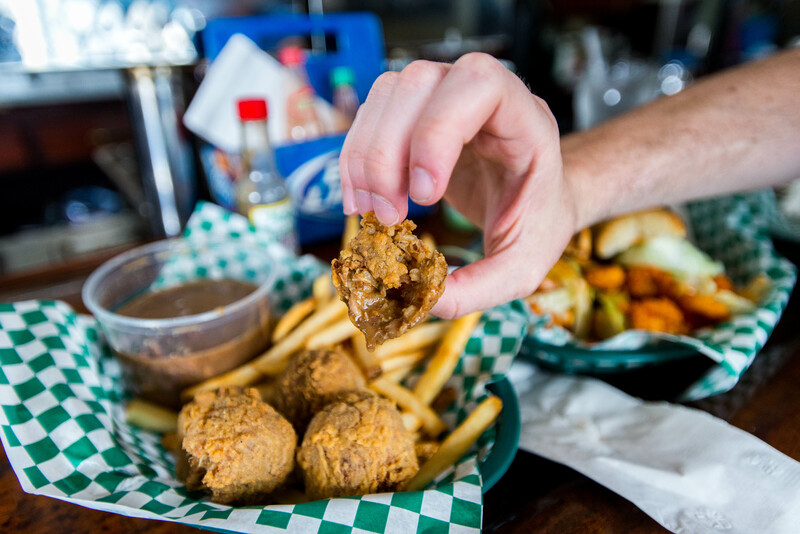 The boudin balls were delicious enough on their own but a dip in that amazing homemade gravy took it to a whole new level. In fact, the gravy was so delicious that I almost contemplated saving the leftovers for later. The gravy was so good that it almost stole the show from the real reason why we came, the poboy sandwich. Even though it was really tempting to order two so we can try different ones, we chose to split a fire cracker shrimp on a roll under the guidance of our bartender. 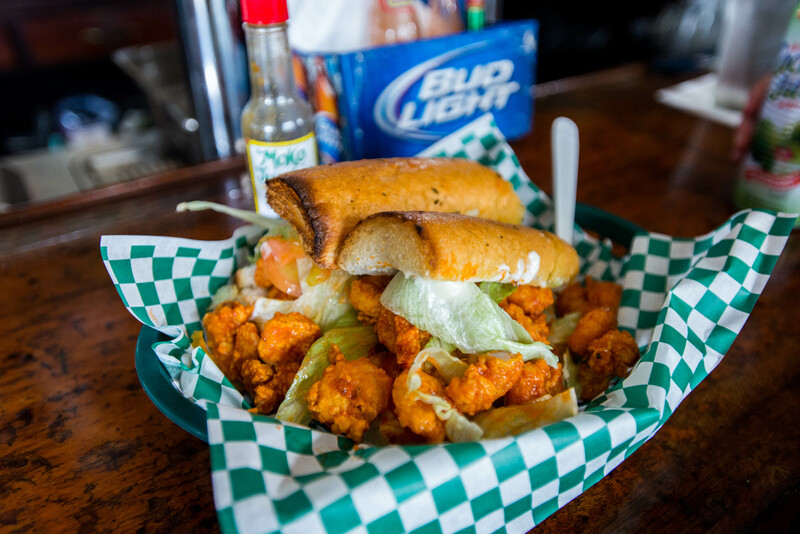 The sandwich arrived piled so high with fried shrimp that the top barely stayed on. The bread was toasted for sturdiness and crunch and slathered with mayo for a little creaminess. The generous helping of the plump shrimp immediately started falling out of my hands as I tried to find the optimal bite of shrimp, lettuce and bread. And I happily reported after polishing off my half of the poboy that there really wasn’t a single bad bite. Another point for neighborhood spots off the beaten path!